Carol H. Lee, MD, FACR, is chair of the ACR’s Communications Committee of the Breast Imaging Commission and past president of the Society of Breast Imaging. 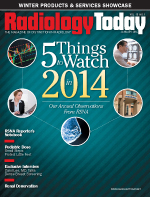 Radiology Today (RT): Dense breast tissue notification laws are on the books in 13 states. With these laws and national legislation under consideration, more women are asking about what this information means and what they should do with it. Lee: Breasts are made up of a variety of tissues that show up differently on mammography. When there is dense breast tissue, it becomes more difficult to find cancers on a mammogram because dense breast tissue shows up as white, and cancers tend to show up as white findings. In terms of density notification, the reason why this has gained momentum is that women feel they have not been fully informed as to how reliable or how good a mammogram is in their particular case in finding cancers. The thought is, “I get a mammogram, and it’s negative; therefore, I don’t have to worry about the possibility that there might be something there.” That’s not necessarily true. The mammogram is not perfect, and we know that it’s less accurate in women who have dense breast tissue. That’s the impetus behind the call for direct notification of a woman’s breast density. RT: While the intent of direct dense breast tissue notification is to keep women informed and help reduce the incidence of breast cancer, there still are issues surrounding how to incorporate breast density into the cancer detection process. Lee: The problem is that breast density is not like your blood pressure or your cholesterol level; it’s not just one number. There’s no division between what is or is not a dense breast. It is a very subjective reading that the radiologist determines from the mammogram, and what constitutes a dense breast sometimes varies quite widely. Women can undergo a mammogram and one radiologist can look at it and say the breast is dense, and another radiologist can look at it and say that the breast is not particularly dense. The other issue is the association of breast density with risk of breast cancer. We do know that having dense breasts makes it harder to find cancers on mammography. But what we don’t know in any individual woman is whether that density is associated with a higher risk of breast cancer. If you compare women with very dense breasts, in the highest category, which is about 10% of all women, with women in the lowest category of breast density, which is another 10% of the population, the risk for women with very dense breasts is about four times greater than for those with very little breast density. The problem is that the majority fall in the group that’s in between the highest and lowest percentages of women with breast density. It’s hard to know exactly where any individual woman falls. RT: As more research is done, do you think there is the potential for greater categorization of what dense breast tissue is and where women fall in those categories? Lee: I’m not sure that research will help sort out what category a woman falls into. In the future, with digital mammography, there may be an automated method for determining how much dense tissue is present. However, the problem is that not only is it about the total amount of dense tissue, it’s also about the pattern of dense tissue. Women may have tissue that is mostly not dense but have one area in the breast where the tissue is very dense. What category would those women fall into? Would they benefit from supplemental screening? It’s a very complicated issue. Breasts are like snowflakes in that there are no two that are exactly alike, even within the same person. Your right breast and your left breast can look different, so it’s difficult to categorize. In the case of something like cholesterol, you know if your number is above a certain level that you would benefit from doing something about it. That is not true with breast density. If you receive notification that you have dense breast tissue, it’s really hard to know what to do about that. Perhaps further research and further refinement of our imaging tools as well as further knowledge of other risk factors will help us sort this out in the future, but right now, I’m not sure that for any individual woman receiving a letter saying that she has dense breast tissue, we know what that information should lead to or that that tells her what she needs to do. RT: Is this just another piece of information a woman needs to bring into the discussion with her physician? Lee: Yes, it is. Again, though, the problem is that many physicians, whether they are general practitioners, gynecologists, or internists, are unclear themselves as to exactly what should be done. Even specialists in breast disease, such as surgeons, radiologists, and medical oncologists, are not certain what is the best thing to do for any individual woman. One size does not fit all; it really is an individual discussion and analysis about what the right thing is in any individual case. RT: As more information like individual notification of dense breast tissue becomes mainstream, is it possibly causing more confusion about when women should get mammograms or if even just a mammogram is enough when it comes to breast cancer screening? Lee: Women who are notified that they have dense breast tissue may even wonder if they should get a mammogram at all because it may be less reliable. What is very important to remember is that with all the methods we have to detect breast cancer, mammography is really the only one that’s been proven to decrease the death rate from breast cancer. If you don’t have dense breasts, that doesn’t mean that you’re not at risk of having breast cancer, and if you have dense breasts, it doesn’t mean that a mammogram is useless. We can still often find cancers with mammography. It’s important to recognize that the starting point is regular mammography. Then the discussion should be, for any individual woman, is there anything more that is appropriate for me? That’s where the discussion needs to take place on an individual basis. If a woman does not have dense breasts but has other risk factors, then perhaps she would benefit from additional screening. If a woman has dense breasts as her only risk factor and does not like the idea of potentially having a false-positive test, perhaps for her no further screening is the right way to go. It’s important to emphasize that we know that mammography decreases mortality. All this discussion about what it means to have dense breast tissue could muddy the water. Are we creating more confusion? Does this make women question whether they should have a mammogram? The answer is that the starting point should be regular annual mammography for all women and then what, if any, additional screening should be done. RT: Is there a need for nationwide dense breast tissue screening? We’re looking at standardizing the type of notification women receive, so would further standardization help or hurt the situation? Lee: With what we know right now, with all the variability in types of density, with all the variability in an individual woman’s risk factors, I don’t think at this point that there should be standardized dense breast tissue screening. For example, I don’t think that being notified that you have dense breast tissue should automatically lead to anything further. I think it should lead to a discussion with your health care provider but not necessarily lead to knee-jerk automatic additional tests. In addition, just because a woman doesn’t have dense breasts doesn’t mean she doesn’t have a need for additional tests. For example, if she is a relative of someone who is a BRCA mutation carrier, even if she doesn’t have dense breasts, she would probably benefit from having supplemental screening. Right now, I would not favor the standardized next step for everybody. It still needs to be individualized. In general, we’re trying to head toward more personalized, individualized medicine, and I think that this is another area where that is the most appropriate approach. Going back to the analogy of blood pressure or cholesterol levels, even in those cases, there is not one standardized treatment. You can draw an analogy that if I have high cholesterol, I could handle that with diet, where somebody else might need one medication or another. In general, the more individualized medical care is, the better it is for the public. RT: What, if anything, is available to help physicians, such as general practitioners and gynecologists, deal with the ramifications of dense breast tissue notification? What do you see as a viable solution for how to handle patients who have been identified as having dense breast tissue? Lee: What I would recommend to physicians who are dealing with this issue is to make dense breast tissue another factor to consider when assessing patients. We already have risk assessment tools that are available online where they can enter various characteristics of a particular patient, such as family history, age of first menstruation, and how many children she has. Then density can be incorporated into that model. Also, a lot of the decision making regarding next steps really is an individual preference of the patient. She may not want a test that has a high false-positive rate. She may not want to potentially have to undergo a breast biopsy that could turn out to be unnecessary. Other women might want absolutely everything they can do to find something early. That all has to play into the decision-making process. Unfortunately, it is a burden, in that the average appointment with your health care provider lasts about seven minutes. Having a discussion about all the things that need to be covered in a limited amount of time is difficult. RT: What consequences are you seeing since states have started instituting mandatory dense breast tissue notification? Lee: Some clinicians, in response to their patients receiving dense breast tissue notification, have decided that they are going to recommend additional screening, whether it is ultrasound or MRI, for every patient who receives this notice. Rather than having a discussion and weighing all the different factors, they’re just saying, “You have dense tissue; go get an ultrasound” or “Go get an MRI.” I don’t think that’s ideal, but I think it’s one of the unavoidable consequences of direct density notification. In the perfect situation, women would have the opportunity, the time, and the money to have a detailed discussion with an informed health care provider. However, that may not be the reality. I think that some health care providers are reacting by creating an automatic way to deal with this notification. It’s not necessarily wrong, but in many cases, the supplemental screening may not be necessary. This can then lead to cost factors, false-positives, and other issues. It takes 10 biopsies for ultrasound-detected findings to get one cancer, as opposed to one in three or four for mammography-detected findings. There are a lot of false-positives involved with ultrasound screening, and that’s one of the downsides to this. That may change as we get better with technology or develop new and better ways of screening, but right now, the situation is that ultrasound is associated with a lot of false-positives. RT: There are criteria and guidelines currently in place outlining how to handle various aspects of breast cancer screening, such as the ACR’s Appropriateness Criteria for Breast Cancer Screening. Are existing practices being overlooked as new guidelines are being introduced? Lee: I do think that the appropriateness criteria could be more widely utilized. Unfortunately, they don’t necessarily refer directly to the issue of breast density. The appropriateness criteria refer to levels of risk but, as we said, it’s hard to know what an individual woman’s risk is. The appropriateness criteria, as they stand now for screening, are not as much help in this setting. RT: Who oversees these types of criteria? Is government involvement clouding the issue of who oversees criteria and guidelines? Lee: I don’t think that the government should go so far as to dictate exactly what any individual person should or shouldn’t have in terms of testing. In terms of medical organizations, the ACR and the American Cancer Society issue guidelines and statements. In addition, the US Preventive Services Task Force issued evidence-based guidelines for breast cancer screening. However, whether they’re adhered to is certainly not anything that anyone can legislate or mandate; it gets down to the level of an individual woman and her doctor. Overall, general awareness of the issue of breast density is a good thing; it leads to increased awareness of breast health. Having the government mandate what exactly we tell women may not be the most appropriate way to deal with dense breast notification. However, I do think that it’s good to have this knowledge, just as it’s good for people to know their blood pressure and cholesterol levels. It’s good to know what your breast tissue density is, as background knowledge, to help with decision making in regards to which screening tool is best for you. RT: Do you believe there is a desire within the imaging industry to standardize the oversight of how to manage the issue of women with dense breast tissue? Lee: I am not aware that the industry is necessarily pushing for this. There is a grassroots movement among the general public, such as the Are You Dense group [an advocacy group that supports “state and federal legislative and regulatory efforts to standardize the communication of dense breast tissue to women”] that’s pushing for direct dense tissue notification, but I’m not aware of any industry efforts. Certainly, every company wants to increase utilization of their particular device, but I think that all the manufacturers would agree that care should be dictated by individual physicians. RT: In conclusion, as more states pass legislation on the topic, how do you see the issue of direct dense breast notification playing out? Lee: This is something that has evolved over the past few years. Direct density notification started in Connecticut [in 2009] and has spread from there. I think that the jury is still out regarding how this is going to impact mortality from breast cancer as well as health care costs. We still don’t really know how this is going to play out. Hopefully, it will improve our ability to deliver the most appropriate cost-effective care to the appropriate populations but that still has to be determined. With the bill currently in the House of Representatives mandating direct notification , as a nationwide requirement, the important thing is the language that’s included in the bill. It needs to strike the right balance between notifying women and giving them information about what this means.